Selle San Marco's Aspide Carbon FX saddle sits right at the top of their range. Well, except for the £250, 110g, handmade superleggera version. It's a very light, very expensive, race-oriented seat and if that's what you're looking for then you won't be disappointed. It's a lovely bit of kit, this saddle. It's very nicely made from good quality materials with attention to detail. The carbon-reinforced base has aluminium reinforcement at critical points and a layer of Pebax shock absorbing foam between it and the Microfeel cover; that's the same stuff you find in the midsoles of running shoes and it's very light (40% lighter than EVA, percentage fans) and good at its job. The rails attach behind the sit bones and as far forward on the nose as possible to allow the maximum amount of flex in the base and it also means you get a very good range of adjustment fore to aft. Selle San Marco use a 'DNA rail' which basically means the rails join near the front of the saddle, then split again, to increase torsional stiffness and stop the saddle rolling when you pedal. Selle San Marco claim a weight of 121g for the Aspide Carbon FX and ours was that exactly. It's an astonishingly light thing to hold in your hand, and of course you're well into the rarified air of marginal gains with this saddle. But the main question is: is it comfy? Well, yes. This is definitely a firm saddle but it doesn't feel monolithic; you can feel some movement when you're hitting the bumpy stuff. 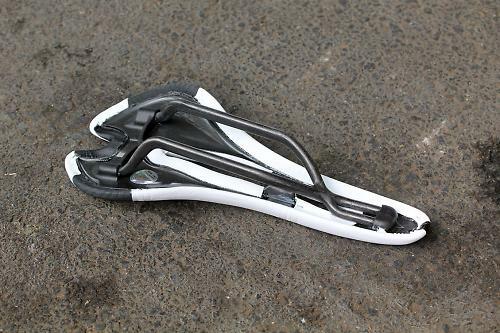 The very lightest saddles – and this is up among them – have to work a bit harder to deliver comfort because all that padding they don't have is weighty, but I've been out for rides of a few hours on the Aspide with no ill effects. The central pressure-relieving cutout is very long; so long in fact that the base needs a strengthening bridge halfway along to stop the two sides splaying out. The cutout did the job for me, I didn't suffer any numbness during testing. The 'wave' profile of the saddle probably helps too; it dips down in the central area and comes back up at the nose. The Aspide is fairly narrow saddle, but even though my personal preference is for a wider seat I got on fine with it. If you're looking at spending £170 on a saddle like this then it's clearly for your very best Sunday or race bike, and light weight and good looks are undoubtedly important. The Aspide ticks both of those boxes, for sure. The usual provisos about everyone's bum being different apply here, of course: if you can, have a go on this saddle (or one of its cheaper siblings) before you buy to check it's singing the same tune as your rear. Super-light Sunday best saddle that's well made and pretty comfy. Amazingly light, very nicely made. Well. Shall we talk about the price? Would you consider buying the product? No, my preference is for something a bit softer riding. Would you recommend the product to a friend? To my friends in the spheres of banking and dentistry, certainly. A saddle for the most discerning riders, that are looking for a light product with high performance. A new ergonomy: the big hole assures a best relief with a perfect balance between support zone and relief zone in the different situation of pedalling. New is the unidirectional carbon finish rail, that features also a greater length (plus 16 mm) and allow one of the best adjustments in the forward and backward movement of the saddle. Lighter and more comfortable thanks to the PEBAX® foam a new material for the padding with extraordinary key technological benefits such as the ultra light weight . The cover shows the combination of different materials (microfeel carbon finish) which results in a smooth finishing.